I don’t know about anyone else, but I sure have a lot of stuff, or swag, from it! Plenty of free pens, notepads, lanyards (even flip flops – really!) abounded in the exhibit hall from the vendors. Well, if you have too many t-shirts, here’s a fantastic thing to do with them! My friend Beth Cackowski (go NJLA IT Section!) reminded me about a book called Generation T: 108 Ways to Transform a T-Shirt, by Megan Nicolay. I had seen this author on one of the morning shows once – Martha Stewart I think actually! Check out this book and, voila! there you have it – something to do with all those free conference t-shirts! Make it into a skirt! Turn a regular t-shirt into a tank or tube top! and more…………. (yes these are all real patterns in the book)! I’m so glad Beth reminded me of that and I am passing the tip along to you! If you actually DO turn any of your conference t-shirts (or any other t-shirts) into something else, let us know! Beth was wise enough to choose t-shirts in larger sizes so she would have ultimate playing-around room with them! 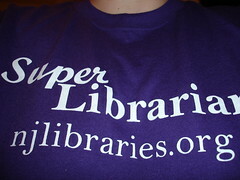 However, I myself will not be taking scissors to my beautiful purple SUPER LIBRARIAN shirt! Entry filed under: Conferences. Tags: Amy Kearns, Conferences, NJLA, t-shirts.